The day is finally here! 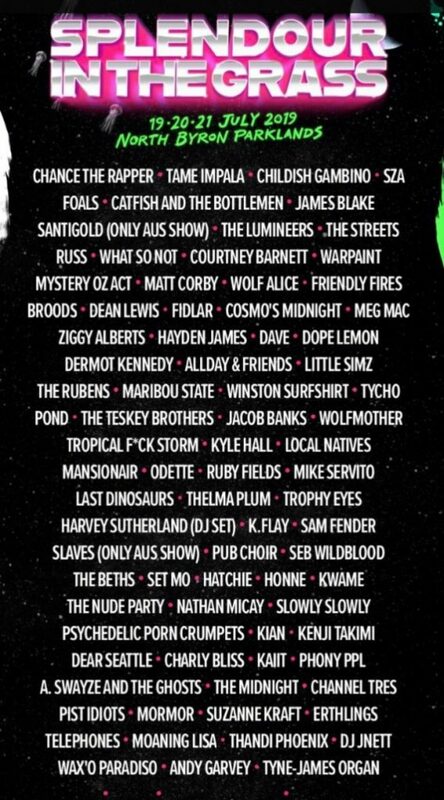 After lengthy swirls of anticipation, rumours and bated breath, Splendour In The Grass has finally announced its 2019 lineup. Headlining this year’s lineup is Tame Impala, Childish Gambino and Chance The Rapper. Elsewhere on the line-up, you’ll find the likes of international acts such as SZA, Foals, James Blake, Catfish & The Bottlemen, Santigold, FIDLAR, The Streets and more. SITG will once again be taking place at North Byron Parklands in Yelgun, just north of Byron Bay. Earlier this year, the festival, as well as Falls, locked in the location as its “forever home” after inking a deal that was almost nine years in the making. Splendour In The Grass will take place from Friday, 19th – Sunday, 21st July. Our second event of (last) Tuesday evening took place at the Art Gallery of New South Wales where we were lucky enough to witness some of Australia’s most established fashion designers, as well as the brightest emerging talent the country has to offer – all on one runway!